Assault. Plays in your core. 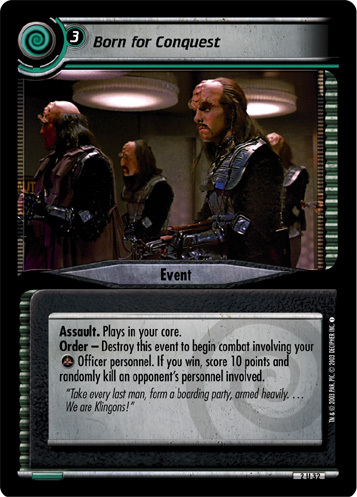 Order - Destroy this event to begin combat involving your Officer personnel. If you win, score 10 points and randomly kill an opponent's personnel involved. "Take every last man, form a boarding party, armed heavily. ... We are Klingons!" Characteristics: combat, kill opponent's personnel, score points, plays in your core, Assault. There are 12 entries for Born for Conquest (ST2E 2 U 32) at the Tradeplace (7 haves and 6 wants). Click here to see all trade list entries for this Uncommon card!